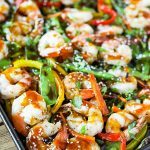 On a large sheet pan, combine shrimp, snow peas, carrots, and bell peppers with vegetable oil, garlic, ginger, a 1/4 teaspoon of kosher salt and several turns of freshly ground black pepper. Roast for about 6 minutes on upper rack of oven then turn broiler to high and continue cooking until shrimp have cooked through and vegetables pick up a little color. IMPORTANT: Cooking time will vary based on shrimp size. Watch closely to avoid overcooking. Bring sauce to a boil and let simmer until thick and smooth. Turn off heat and stir in orange juice. Remove shrimp and vegetables from oven, drizzle with 1/2 of sauce. Serve with steamed rice or cauliflower rice and remaining sauce.